The White-Tailed Brichardi is absolutely one of the most elegant of the Lake Tanganyika cichlids! The White Tailed Brichardi Neolamprologus gracilis is truly a graceful fish. They have slender bodies and delicate colors. Their lyre shaped tail is tipped in white and both the male and female develop beautiful long streaming filaments on their fins. In the wild some specimens have been seen with flowing filaments equal in length to their body. They are affectionately called the Graceful Lamprologus as well as Gracilis Cichlid and Blue-tail Brichardi. This beautiful fish makes an elegant addition to the aquarium. It is easy to care for as long as regular water changes are done. It is a relatively small cichlid, reaching only about 3 1/2 inches (9 cm) in length, so it doesn't require a large aquarium. A minimum 10 gallon tank will work for one or two individuals and they will adapt to a wide range of water conditions and eat a wide variety of aquarium foods. With its color, form and adaptability, it is a great choice for both the beginner and advance aquarist. The Graceful Lamprologus have a less aggressive demeanor, which makes them some of the easier Lake Tanganyika cichlids to keep in a community setting. They can be kept in pairs or singly, or in harems that form a group of 6 or more. They are generally aggressive toward those of the same species, but may tolerate others of their own genus. In the wild this cichlid has been seen cohabiting with its close relative the Fairy Cichlid Neolamprologus brichardi. It's not suggested keeping them together in the aquarium however, since hybrids can be formed. They are not as aggressive as many other cichlids so may be kept with other similar tempered types of Lake Tanganyika cichlids. The tank just needs to be large enough to support the number of fish being kept and have plenty of rockwork for each species to have their own territories. hey are best kept in a species tank, or a group of these fish can be kept in a good sized aquarium with other similar types of Lamprologine Shell-dwellers. Other good tankmates are a large school of Herring cichlids of the Cyprichromis genus like the Sardine Cichlid Cyprichromis leptosoma, as well as Goby Cichlids, Julidochromis species, and Tropheus species. In fact this grouping is very attractive in a 55 gallon tank, as all have different swimming levels and breeding activities. This pretty cichlid is not shy about swimming out in the open. They will breed readily and are easy to feed as well. But they do like an aquarium with lots of rock formations creating caves along with shells to provide areas of retreat and for spawning. A sandy substrate is best. Though they are not avid diggers, they may dig out spawning territories around decor. They won't harm plants, and including them will help the fry survive. The White Tailed Brichardi Neolamprologus gracilis was described by Brichard in 1989. These fish are endemic to Lake Tanganyika, Africa. They are found along the western coast around Cape Kapampa, Zaire and along the eastern coast below the Mahale Mountains near Kibwesa, Tanzania. This species is listed on the IUCN Red List as Lease Concern (LC). Although it is endemic to Lake Malawi, it is widespread along both the west and east shores of the lake and has no recognized threats at present. Other common names this fish is known by include Graceful Lamprologus, Gracilis Cichlid and Blue-tail Brichardi. They inhabit rocky coastlines at depths of 30 - 60 feet (9 - 18 m). They are found either singly or in small groups. When breeding they will form monogamous pairs and spawn in caves. They are planktivores and will feed primarily on swarms of plankton drifting in the open water, but will pick at aufwuchs as well. Aufwuchs refers to tough stringy algae that is attached to rocks. "Loose" Aufwuchs can contain insect larvae, nymphs, crustaceans, snails, mites and zooplankton. Social Grouping: Varies - They occur singly or in small groups, and will form monogamous pairs when breeding. The White-Tailed Brichardi is a graceful elongated fish with a continuous dorsal fin. The tail fin is lyre shaped and they develop long flowing filaments on all unpaired fins. These fish are in a category called "fairy" cichlids due to their long flowing fins. They are relatively small, only reaching up to about 3 1/2 inches (9 cm) in length. The Neolamprologus genus will generally live 8 - 10 years with proper care. They are mostly white colored with a slender white to light blue line under the eye. The iris of the eye is split between blue and white. Their caudal fin is tipped in white and is what earns them their common name. Unlike the Fairy Cichlid Neolamprologus brichardi, they lack the dark markings on their face. Size of fish - inches: 3.5 inches (8.99 cm) - They are a relatively small cichlid, only reaching 3.54" (9 cm) in length. 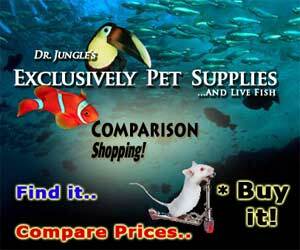 These fish make a great choice for both the beginner and advance aquarist. They are moderately easy to care for as long as the tank is properly maintained and they have the right tank mates. The aquarium needs regular, small water changes. They are fairly peaceful, making good inhabitants for the community cichlid tank. They will eat a wide variety of aquarium foods and will readily breed. The White-Tailed Brichardi cichlids are omnivores that are primarily planktivorous. In the wild they bulk of their diet is swarms of open water plankton, but they will also pick at aufwuchs, a loose stringy algae which contains small crustacean and other micro-organisms. In the aquarium they will generally eat all kinds of live, fresh, and flake foods. To keep a good balance give them a high quality flake food or pellet everyday. Regularly supplement these foods with proteins like brine shrimp (either live or frozen) or daphnia. They can be fed mysis shrimp, earthworm flake, frozen adult brine shrimp and once in a while spirulina. Other special food for carnivorous Lake Tanganyika cichlids are acceptable. It is suggested that you do not feed live foods and tubifex worms due to possible diseases and pathogens that may be transferred to your fish. Feed 2 to 5 small pinches of food a day in smaller amounts instead of a large quantity once a day. A one-day-a-week 'fast' can also be beneficial. All fish benefit from vitamins and supplements added to their foods. Diet Type: Omnivore - Although they are an omnivore, the bulk of their natural diet is plankton. Do water changes of 10% to 15% a week, or more frequently depending on the nitrite/ammonia levels and stocking numbers. The Lake Tanganyika cichlids cannot handle large water changes very well unless the new water chemistry closely matches the water they are in. If a large water change is needed, changing 15% every couple of days should bring water back to normal. This inability to tolerate large water changes is due to Lake Tanganyika being very deep and the water tends to stay stable. Water Changes: Weekly - Water changes of 10-15% weekly are suggested, and only more frequently if heavily stocked or the water parameters are off. The White-Tailed Brichardi will swim mostly in the middle and bottom areas of the aquarium. A minimum 10 gallon tank for pair is suggested, with a 20 gallon for a group and 55 gallons or more for a community type tank. They do fine in either freshwater or brackish freshwater but need good water movement along with very strong and efficient filtration. Lake Tanganyika is a very oxygen rich lake so bubblers need to be going day and night, even if there are plants. Regularly check nitrates and ph, nitrates should be no more than 25 ppm and a pH less than 7 is not tolerated. In addition keep an eye on total hardness and carbonate hardness. Avoid overfeeding and overstocking. Provide a sandy or very small sized gravel substrate. Sand used for salt water tanks can help keep the pH up as well as the addition of crushed coral. Crushed coral and aragonite sands do tend to dissolve easier than salts. They should have rock formations creating caves along with shells for spawning. Include some plants to help the fry survive. A good plant arrangement can have Cryptocoryne species in the foreground, in the middle ground use Swordplants that are the larger variety, and the very back can have Water Fern. For a different or varied look you can plant on the porous rock with such species as Anubias and Java Fern. Minimum Tank Size: 10 gal (38 L) - A minimum of 10 gallons is suggested for pair, 20 gallons for a species tank, and 55 gallons or more is needed for mixing species. Suitable for Nano Tank: Sometimes - A moderately large nano tank of 10 gallons can be used for a pair, or 20 gallons for a small group, but they are not large enough when mixing species. The White-Tailed Brichardi is a community cichlid. It is not as aggressive as other cichlids, but is still a cichlid none the less. They may be kept with some of the Sardine Cichlids like the Sardine (Slender) Cichlid Cyprichromis leptosoma, Goby Cichlids, Julidochromis species like the Dickfeld's Julie Julidochromis dickfeldi, and Tropheus species. This grouping works well as all have different swimming levels and breeding activities. They can be kept in pairs or singly, or in harems that form a group of 6 or more. They are generally aggressive toward those of the same species, and at times will kill any of their type that venture into their territory. They may tolerate their own genus, but this is not suggested since hybrids can be formed. No way to tell until they are adults, then the male may be a little larger. 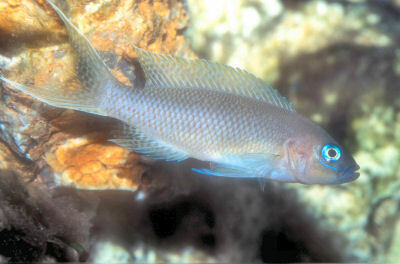 The White-Tailed Brichardi has been bred in captivity and will readily spawn. Purchase 6 or more juveniles and allow them to pair up. After a pair or small groups of 3 or more has formed, remove the remaining White-Tailed Brichardi since the newly established pair will attack the others if they enter their territory. If left in the tank, these "exiled" fish may eventually be killed if they persist in going into the established territory. Provide a pair with at least 2 or more shells, as this is their preferred spawning container. Females deposit their eggs in the shell and the male will then fertilize them. The parents both share the duty of guarding the eggs and fry. They will also allow older siblings to care for new spawns while they start a new generation. Siblings at only 1/4 of an inch long will attack intruding fish ten times their own size. It is quite amusing to watch a tiny fry make a large fish back away. Fry can be fed de-encapsulated brine shrimp as well as crushed dry foods, although hatched or frozen baby artemia, and/or artemia/brine replacement foods are needed due to their high lipid and protein level. These levels contribute to improved survival rates and increased growth rates. Of course in a community tank, the survival rate of the fry may drop. It is a good idea to remove plecostomos and loaches as they will eat the babies and eggs at night. See the description of breeding monogamous cichlids in: Breeding Freshwater Fish: Cichlids. The White-Tailed Brichardi is rather rare, but is occasionally available online or in fish stores, and are moderately expensive for juveniles. Purchase from a reputable dealer. Due to hybridization it takes a trained eye to choose the correct color strain that has not been crossed.